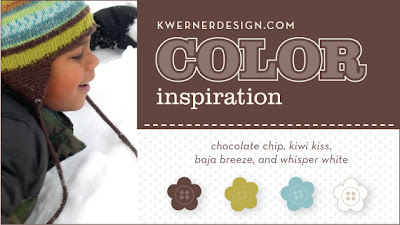 Hope your week has been going well - things here have been flying by - but I am glad that I got a chance to play along with Kristina Werner's Color Inspiration Challenge #50 this week. 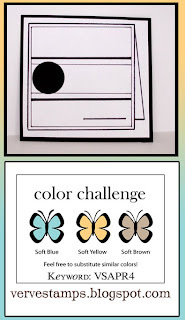 Can you believe she has done 50 color challenges! I cut out the window panels with my x-acto knife and then covered it with some opalescent gift wrap that is transparent - so that you can see the inside of the window showing a vase with a flower. It's Monday and that means its time for another card for my holiday pile! I love being part of the Christmas Stampin All Year Long group - it totally is keeping me motivated to keep making my Holiday cards - before the holidays -- I love adding another holiday card to my card box :) . This week, we had a sketch challenge - that I sorta kinda did - (I couldn't make the diamond part work - so I did a diamond through putting little pink Stickles dots in a diamond shape around the ginger bread house). 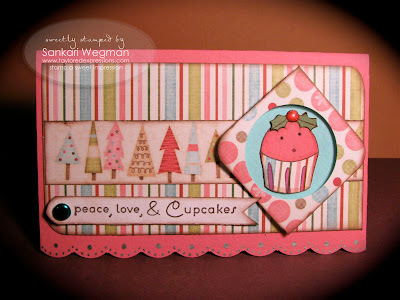 I loved making this card and totally enjoyed my little stamp therapy time in creating it :) Please join us in making your holiday cards with us - you can see the rest of the cards from the challenge divas here and join in and link up to the same blog with your holiday yumminess!!! Thanks so much for coming over for a visit and hope you are all doing well!! 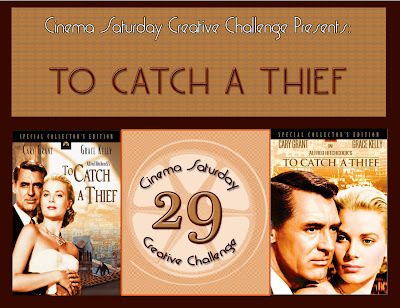 Welcome to our 29th Challenge - where this week we are featuring the 1955 Oscar winning movie starring Cary Grant and Grace Kelley - To Catch a Thief. This beautiful movie was directed by Alfred Hitchcock and is a beautiful blend of mystery, intrigue, humour, wit and of course romance. It won an Oscar for best cinematography. First of all - there are so many things about this movie that I love and was inspired by that its hard to find one thing to make a card from - and having said that - as soon as I saw the golden ball gown at the end of the movie - I knew I wanted to make a card inspired by that dress! Grace Kelley is just stunning in this movie - her outfits are just gorgeous and flowy and beautiful! I remember watching this movie a long long time ago and just admiring her every move and that her name Grace was so true to her form - she really epitomizes Grace itself! I was just blown away by her golden gown at the end of the movie at the ball - wow - what a dress - I loved the butterflies (also golden) along her dress - and so I created my card - inspired by the golden dress at the end. The sentiment that I chose was - What would I do without you. **** Spoiler alert In the last scene of the movie - Grace Kelly asks Cary Grant - what he would have done without her help and he acknowledges that he needed her assistance more than he realized. I love that there are so many parts of the dialouge that are extempor - and the wit between the characters just tickles me! 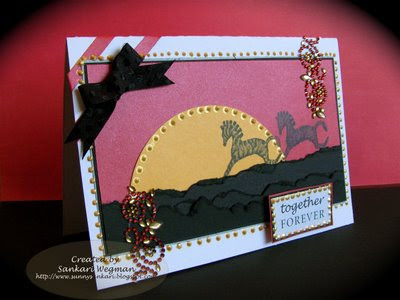 This is a fun challenge (make a card with layers inspired by the movie To Catch a Thief) - for more details - please check out the Cinema Saturday Creative Challenge! Can't wait to see your beautiful creations!!! Thank you so much for visiting my little corner!!! I didn't get to play along last week with Taylor's Friday Cupcake Challenge - and so I had to play along! I didn't use any cupcakes :( but I did use some of the awesome papers from the April 20th Key Ingredients Kit- (it comes with cardstock, coordinating DP, glitter, flower bling embellishments and coordinating ribbon). 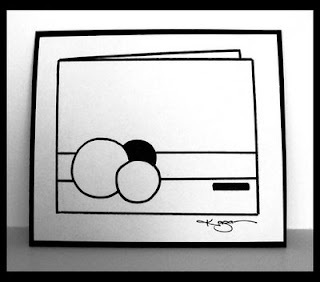 I absolutely love these papers and had fun arranging them in the rectangle element of the sketch. I used a technique with tacky tape and glitter that the awesome Lynn Mercurio featured a while ago on SCS - this technique works like a charm! 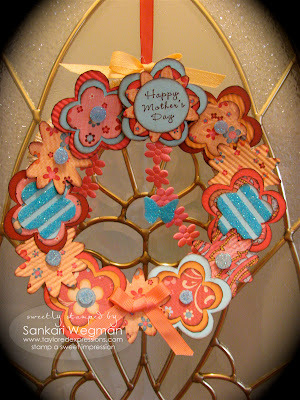 I made this little wreath and card for a friend of mine for Mother's Day. This is made using a small paper plate (like a dessert plate - I used the Chinet variety for more strength). I wrapped the plate with some plain ribbon that I had lying around so that when I adhered the flowers it wouldn't be against a plain paper plate. I drew a 5 petaled flower of three different sizes and cut them out from the various papers and then adhered it in different combinations and arranged around the plate. This kit comes with the delicious glitter called blue rapture: it is just yummy - I used it on the buttons, the butterfly and on the flower - it give it just an extra umph of sparkle :) I also love this ribbon of pink flowers that I put the butterfly on. 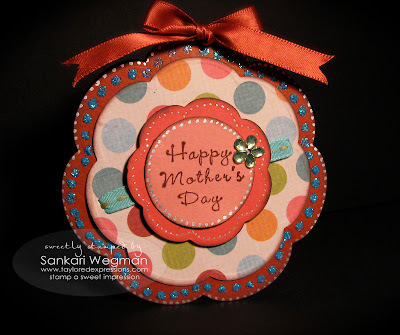 The Happy Mother's Day sentiment is from the Fresh Flowers stamp set and fits perfectly onto a 1 1/4" circle punch to be on the inside of a flower. I wanted to make a coordinating card for my friend - and so I made a quick coordinating card that I wanted to tie in the flowered theme of the wreath and so I made a flower card using the new Blossom Spellbinders nestabilities set (check out all the new Spellbinders that Taylor has in her store!) 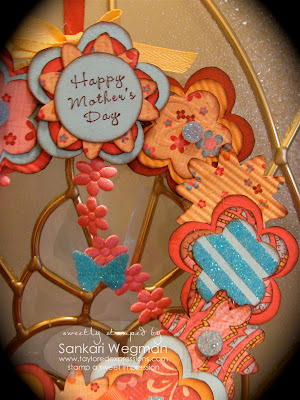 I had so much fun making this card - it was super quick and fun to make and embellish with the glitter and the sweet little flower bling embellishment. I love this DP from the April Key Ingredient's set - its so much fun and colorful. Check out the awesome projects from the rest of the ladies from the Baker's Dozen who have also made some awesomely fabulous creations using the the April Key Ingredient's kit! And can't wait to see your creations with this with this fun kit! Hope you are all having a fabulous start to your week! As you might know - Monday's the day that I participate in the Christmas Sampin' All Year Long group - where every week - we make a Christmas card to stay ahead of the game. This week our awesome group leader Maria provides us with a sketch tHere is a super quick card that I made - i punched out little fowers using my Creative Memories Medow Makers punch and adhered them in an alternating pattern to a scallop punch where the inside circle was punched out... Then I tied little ribbons to it and lastly I added some dots and bling. I am happy to be able to knock down a Christmas card - and add it to the holiday card box :) This is such a great group for staying motivated on your holiday cards - you can join in on the fun - check out the Christmas Stampin' All Year Long group! Hope you are having a fabu start to your Monday morning! 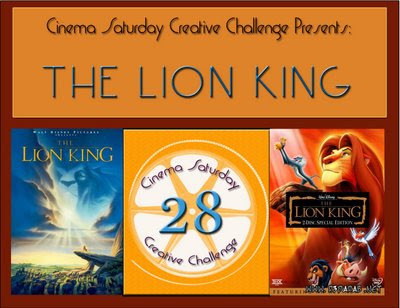 Welcome to our 28th Cinema Saturday Challenge - where this week, we are so excited to feature the 1995 2 time Oscar winning animated movie: The Lion King! The requirement this week is to create a movie with an animal inspired by the movie. Which is really simple when you look at the wide range of inspiration from the movie! One of my favorite relationships that are explored in this movie is that between Simba and his father. There is a scene where Simba asks his father: We'll be together always, right? and his father tells him to look up at the stars and he will see that the great kings of the past are always there to guide him and so is he.... I always loved that part... just the connection between generations that is there and that love that is always there forever - and how the blessings of the ancestors are there to guide you in your path today.... so I took this inspiration to create my card: Together Forever. Stamps: In the Wild stamp set from Stampin Up! 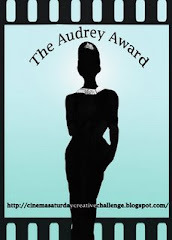 We have a special Guest designer over at the Cinema Saturday Creative Challenge - and I hope you all hop on over to the Cinema Saturday blog and check out all the details for the challenge - AND that you play along with us this week!!! Cmon'! Hope you are having an awesome start to your weekend! Last night, my DH and I had a movie night and he finally watched Twillight with me (I already had watched it - but have been wanting to see it with him) - it was fun to watch a movie together and chillax a little after the insane week that we have been having! Since I had already watched the movie, I worked on a card while we watched (that still counts as a date night right? lol!) and worked on this beautiful Verve Sketch from Julee. I am simply in love with the Fresh Flowers stamp set from Taylored Expressions- and had to play along using this beautiful set. 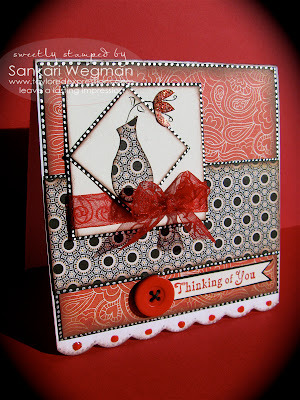 Ink: Rose Red from Stampin Up! I had so much fun making this card ! And I am so happy its Friday! What are your Friday plans?Hope all of you are doing well!!! Seriously! Where is this week going? Why does it seem that some weeks are super slow and some weeks are super fast? Maybe its the weather... its been getting so nice around here that we have been outside alot and suddenly the day seems over with..! I loved this Verve sketch that Julee has created and I also have been wanting to play along with my buddy Libby's challenge: From Courtney's Closet (an Inspiration Challenge) where she picks a cute little somethin from her cutie patootie daughter Courtney's closet as an inspiration for a card, etc. You can see this week's picture here (isn't her daughter soooo adorable?!) I loved that cute outfit that Courtney is wearing... and I wish I had some scotty stamps... but I don't ... so I went with the colors of the dress and created a little card based on the sketch. 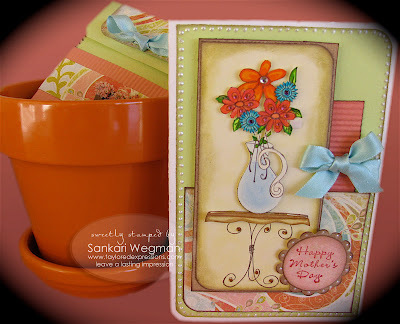 I used one of my fave new sets from Taylored Expressions for this card called Fresh Flowers. 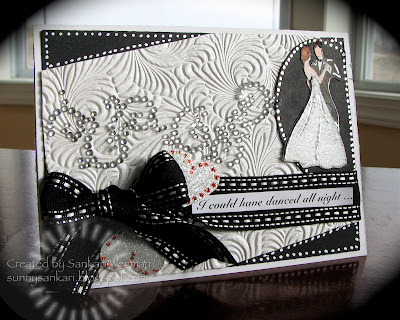 I made this card for a special lady who is such an inspiration to me... the vase and flower were paper pieced and I created a little border of silver dots... because Courtney's dress had a cute little black and white border. 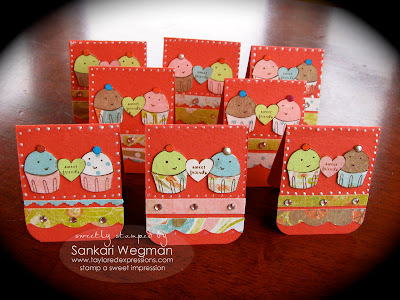 Ink: Ruby Red Stampin Up! I hope you all have a chance to try Libby's challenge and Julee's sketch! I was psyched to have a half day off today and so I don't have to run to work till lunchtime - so I am off to the exciting world of cleaning up and laundry... I know I know... its such a glamourous task that I have ahead of me... kind of red carpet glamour... but in my case more like vacumming the red carpet in our living room :) LOL! Its hard to believe how quickly this week is flying by - I don't know how it happens because when I turned around it was just sunday and here we are at Wednesday! I love Julee's sketch #82 this week over at Mojo Monday and wanted to play along. 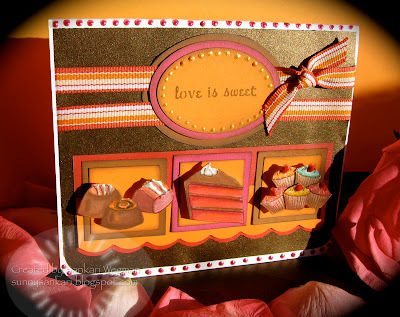 I love the Downtown Diva set from Taylored Expressions and was excited to use the papers from the Sweet Branch Collection - and so I made this card for a dear friend of mine. I just wanted to thank all of you, who wrote such sweet comments about the little family accident etc. from the last post.... I am truly grateful for each of you who wrote such sweet words - it really gave me so much comfort...It's amazing to me how a sweet word from a friend can suddenly uplift you - how kindness and and understanding - can make such a difference in how you face things - from thinking that you are alone - to feeling that you are supported. So, this card is dedicated to all of you! You are all priceless and are the sweetest! Thank you so much - you don't know how much it has touched my heart! You all are just priceless and I am so grateful to have met you in blogland! Hope that all of you are having a wonderful Wednesday - and that you have a chance to stop and smell the roses...! Things here have been a little bit busy. We had a little unfortunate accident in the family - but everyone is okay now and recovering... times like these you are reminded about the preciousness of life. I have been a little busy taking care of some family matters... but am hoping for more play time this week :) Hope you all had a lovely Easter... speaking of which how about a Christmas card!! Sorry for being a little MIA recently... haven't had much time to stamp - just so much family and health issues... so this feels great to get some card therapy in... and so this is a super quick card... I timed it at 23 minutes :). I loved using the Christmas Key Ingredients Kit from Taylored Expressions for this little holiday cupcake card... i love these christmas papers... and I of course love this little cupcake with the sweet holly trimming at the top. 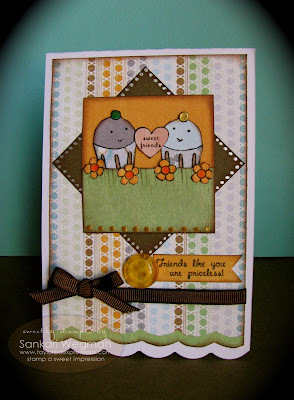 Ink: Chocolate Chip from Stampin Up! 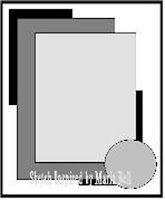 Accessories: Corner Rounder, silver marker, liquid pearls for the cherry, 1 3/4 circle punch from Stampin Up! 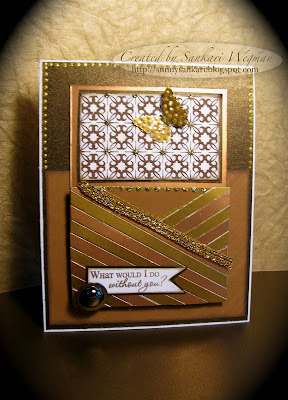 Hope you will check out the Christams Stampin All Year Blog and join in on the fun!!! I am psyched each week to knock down another Christams card!!! Woot!!! Wishing all of you a wonderful Happy Happy new week! Happy Saturday! 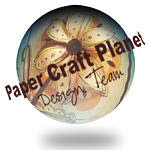 This week, I am the hostess for the sketch challenge over at Paper Craft Planet. 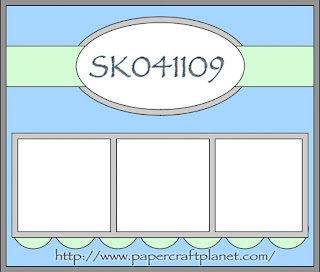 Just make a card using the sketch at the left and upload it to Paper Craft Planet and use the keyword: SK041109 for the tag (the keyword is today's date april 11 of the year 09). I hope you play along with the sketch! 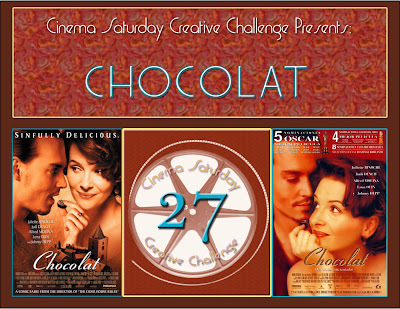 I used my sketch for this week's Cinema Saturday Creative Challenge, where this week we are featuring the movie: Chocolat with Juliette Binoche and Johnny Depp. This movie was released in 2000 and is based on a novel by the same name and earned 5 Academy nominations including best actress for Juliette Binoche! Well there are two reasons why I love this movie: Johnny Depp and chocolates! lol! I think it was last week that I was thinking that it would be just awesome to have a Johnny Depp chocolate figure - now that would be combining two loves into one yummy result!!! I really love this movie also for the love that it inspires. In every story there is a love story... and Vianne (Juliette Binoche's Character) inspires that love story to be fulfilled. Wheather its the love for the grandmother to be able to see her grandson, or the passion to be rekindled in a marriage, or for two eldery people to find their way to each other's hearts or about self love - where a person has the courage to stand up for themselves. In every story in this movie, there is a beautiful love story that is waiting to blossom and be fulfilled. I love the sweet love between Roux and Vianne who understand each other's outsider-ness and also respect each other's space and boundries. They are just so sweet together. And of course, I just simply love Johnny Depp - aside from his obvious yumminess - he has the amazing ability to bring alive the imagination in his roles along with creating such a depth and breadth of all his characters. I truly admire him for his amazing talent and the breath of fresh air he brings to his roles. 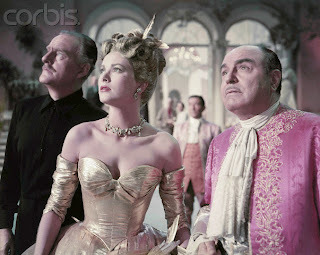 And this movie was no different - I adore - simply A-DORE his role as Roux... (holy hotness!) I love his chocolatey eyes in this movie and it was so nice to watch this movie again and see the beautiful interaction between Vianne and Roux. Love it!!! Accessories: corner rounder for the scalloped edges and for the rounded corners, liquid pearls, prismacolor pencils, dimensionals, ribbon, square punches from Creative Memories, oval cutting system from Creative Memories. I hope you play along with us this week at both the sketch challenge and also at the Cinema Saturday Creative Challenge! This week's requirement at the Cinema Saturday Challenge is to use anything sweet (sweet images) from chocolate to cupcakes, etc. 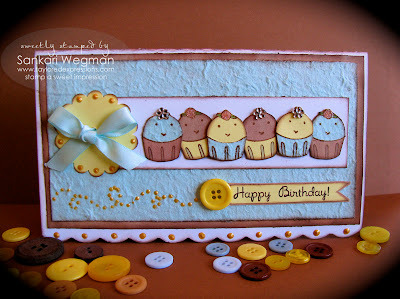 - just make a card with something sweet and link your blog to the post over at the Cinema Saturday Challenge!!! How easy is that?!!! Can't wait to see your sweet creations!!! Thanks for visiting this little corner! 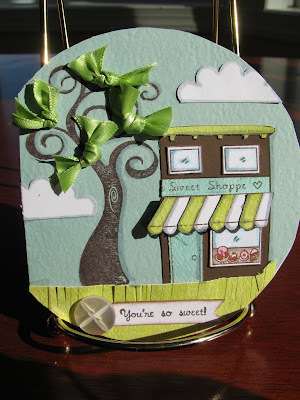 So this is what I came up with: a little scene of a Sweet Shoppe with ribbons for leaves and the sentiment "You're so sweet": the stamps are from Taylored Expressions ( the tree is from the Branching Out set and the shop and sentiment is from the Downtown Diva set). I am running out the door right now - and so I will come back and write all the details of the card - just wanted to get it in before the deadline tonight! Ack! Hope all are doing well!!! 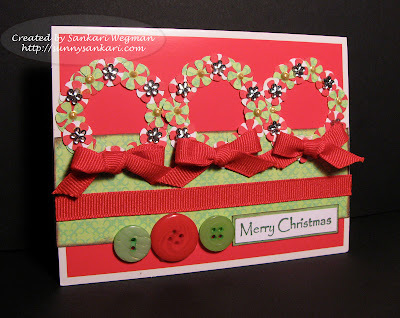 It’s Monday Morning and that means another challenge from the Christmas Stampin’ All Year Long challenge! Every week, there is a new challenge to help us get our Christmas cards done before Christmas :) This is such a great motivational challenge group because it really helps to just to one card a week leading up to the holiday season, so that there is more time to enjoy the holidays! The other reason that I love being part of this challenge group is that I have a chance to use up my holiday papers and embellies and other such items that have been tucked away and overlooked, neglected or forgotten. Have you ever found something that you bought to make for a particular seasonal holiday and then never used it because of loss of time, or that it got forgotten? Well that’s what happened to these cute little silver presents embellies on today’s card. I found them again as I started to sort through all my holiday stuff and couldn’t wait to use it. This week’s challenge was a sketch challenge. Here is the sketch that we followed and here is my card based on this sketch. Ink: Not quite Navy SU! It’s nice to be able to have one more card done and add to the pile! I kinda feel like its crazy to be this organized ahead of Christmas – its so unlike me…! Please join in on the challenge you can find more details and check out all the beautiful samples on the Christmas Stampin’ All Year Long blog! And Thank you so much for visiting my little corner ! Today is the big release day over at Taylored Expessions where you can see the two new stamp sets fresh out of the oven - plus a whole lot more. 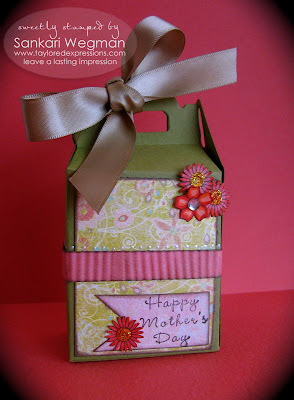 To celebrate - I made a quick (I am talking 14 minute card) and a coordinating purse!! I loved the colors that Kristina has up for her ColorInspirationChallenge this week - so I used that as inspiration - as well as Taylor's awesome sketch #62. I love these new stamps that Taylor has in her Downtown Diva stamp set - and one of my favorite images is this cute little purses stamp with the sentiment Retail Therapy (and who couldn't use a little retail therapy? I know I could!!). I created a matching "purse favor box", which is going to be available at the Taylored Expressions store today - it is perfect for Mother's Day or just giving a gift for that special lady! 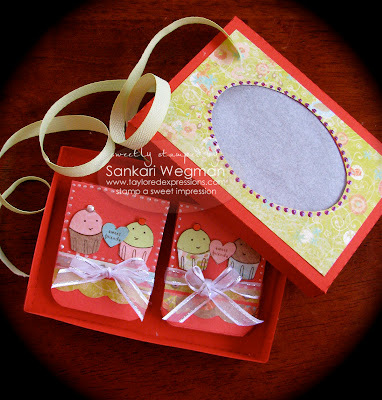 I also used the Favor Box with the oval window opening from Taylor's Store (I love all her Favor Boxes - they are sooo convenient to have on hand - already scored - ready to be folded) and covered the opening with some vellum. I decided to make some mini note cards for my mother's day gift for my mom that she can give out with gifts. I used one 8 1/2 x 11" paper from the Mother's Day Key Ingredients kit that I folded into a trifold and then cut out the 2 3/16th inches. I paper pieced this new cuppie set with the papers from the Mother's Day Key Ingredients kit - got to love all the rhinestones in this kit! Isn't this image of Cuppie SO cute? It was so much fun to use this new Cuppie from the Downtown Diva set - that set is so versatile - its perfect for any project! Well, Taylored Expressions is the place to be this morning because the store is ready to be shopped at - talk about Retail Therapy!!! To keep up with all of these great deals and steals - you can sign up for the newsletter if you are not already subscribed (you can find the signup widget in the sidebar of the homepage). It's chock full of inspiration and of course you'll be the first to know about all the new products and sales at the TE Store!!! Hope you are all having a wonderful weekend and have fun shopping at Taylored Expressions!!! See you there!!! 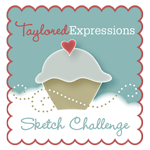 Welcome to the second day of sneak peeks from Taylored Expressions!!! YAY! !Yesterday we got to show you some of the images from the stamp set Fresh Flowers, today we are showing sneak peeks from this awesome set called Downtown Diva - and you are going to LOVE it!!! These images are sooo cute!!! I have so many ideas spinning in my head from this set that I am dizzy! LOL! Both of these stamp sets are just full of images and sentiments that are perfect for Mother's Day, Thank you Cards, Let's Shop (Girlfriends cards), Happy Birthday Cards, and Just Because cards! Can't wait to ink them all up - and the images that I HAD to ink up as soon as I saw it was the one with these sweet buildings! I inked these up on Stazon Black and then pulled out my watercolors and had so much fun painting. I also added a little dimension to the awning by popping it out on dimnsionals. I used Taylor's Sketch # 59 for this card and the sentiment reads: People who say money can't buy happiness, don't know where to shop!!! I was sooo psyched when I saw that because my GF and I just had a shopping spree a few weeks ago and had so much fun hitting the shoe stores, craft stores and don't forget the dessert stores!! This card is made for her and I can't wait to give it to her! 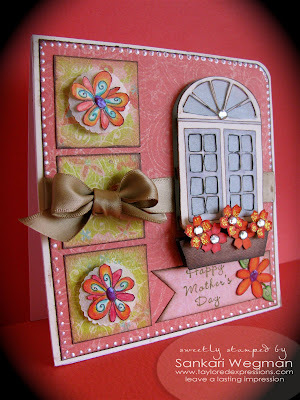 For both the outside and inside, I used the Mother's Day Key Ingredient's kit that comes with heavy cardstock in beautiful colors with coordinating DP, flowers, ribbon and rhinestones. 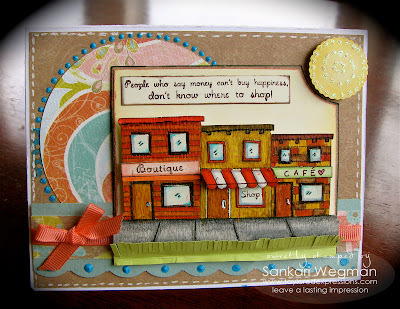 I decorated the inside of the card to read: "Shop till you drop!" LOVE IT!!! I have so many GF and SIL's who love to shop (I like to browse) and I can't wait to make a few of these cards for them! Aren't those cupcakes so cute holding purses!! I also made a little coordinating Favor Box for my buddy that I am going to fill with her favorite chocolate!! 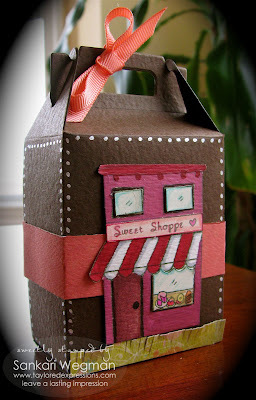 I used another stamp in this awesome stamp set that reads: Sweet Shoppe. I used the the matching coordinating papers and ribbon from the Key ingredients kit. You have to check out all the amazing Favor Boxes that Taylor has in her store - they are just amazingly wonderful to have on hand because you can fix up a coordinating gift set in just a few minutes! Stamps: Downtown Diva stamp set from Taylored Expressions! Woo-hoo!!! I totally have LOVED using the images from both of these stamp sets (you can see the sneak peek from yesterday here) and can't wait for the big release day!!! 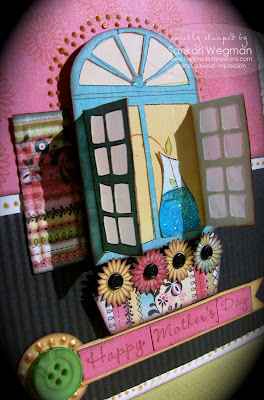 Speaking of which - guess what - Taylor will be releasing all of the new Spellbinders dies tomorrow also. Also two new Twinkles will be released tomorrow - (clear rhintestones in various sizes and Multi-colored twinkles in various shapes (stars, hearts, flowers, teardrops, squares, etc.) Taylor is offering an awesome deal that if you purchase both of these new Twinkles, she will throw in a multi-colored round twinkles FREE. Also JustRite is discontinuing all of their self-inking stampers! They are also discontinuing their Oval Stamper I Ensemble, Birthday Stamp Ensemble, and Oval Stamper I Blister Pack. Taylor is offering a 30% discount on these items as long as quantities last. Seriously What awesome deals!!! 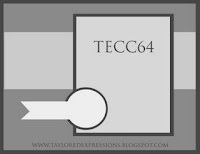 Taylored Expressions is the place to be and to keep up with all of these great deals and steals - you can sign up for the newsletter if you are not already subscribed (you can find the signup widget in the sidebar of the homepage). It's chock full of inspiration and of course you'll be the first to know about all the new products and sales at the TE Store!!! Hope you are all having a wonderful weekend and have fun shopping at tonight at Taylored Expressions!!! See you there!!! PS - head back here tomorrow - for the Sneak Peek Celebration Day - there are a few more samples from all of us for you!!! Welcome Everyone to the 26th Challenge from Cinema Saturday, where we pick a movie each week from which to draw inspiration in making a card, LO or altered item. This week, we have picked the classic movie: My Fair Lady, starring our beloved Audrey Hepburn and Rex Harrison. I feel like I know this movie like the back of my hand because I have watched it and sang along, day dreamed to it every since I was 12. My father bought me the complete set of Sound of Music and My Fair Lady (back in the day where it was VHS :) and I remember that was the biggest treat for me! I watched this movie EVERY day during the summer of 8th grade... I adored Eliza Do-little, had a mini crush on Freddie and dreamed about dancing with the prince (I had a HUGE crush on the prince...). I used to be able to recite the lines to the whole movie word for word... and loved singing in my completely off tune voice to the songs from the movie... :) I love every song: The Rain in Spain, With A Little Bit of Luck, Ordinary Man, I'm getting married in the morning and countlesssssssss other classic songs!!!! So that's the theme that I decided to focus on was the Embassy Ball scene where she dances with the Prince. I used Kazan's lovely or "loverly"as Eliza Dolittle from My Fair Lady would say, sketch #23 from 2 Sketches 4 You. If you haven't tried one of their sketches - you really have to! I am always amazed by the creations that Laura and Kazan come up with as well as their amazing DT! The one thing that I really like about their sketch challenge - is that they layout the basic elements of the sketch and based on that you are free to let your imagination lead you! I like the open white space above the three elements of the sketch and thought I would fill it up with the bling trail of Eliza dancing with her prince sans tiara (couldn't fit it in).I added two metallic hearts at the bottom bordered with candy cane stickles for accents. Accessories: ribbon, silver pen, oval cutter system from Creative Memories, Polysparkle EP, Versamark, Sentiment created in Word reads: I could have danced all night... from the instrumental music that is playing that as she is dancing with the prince. Here is a link to the Youtube video of this scene where she first makes her real public apperence (I mean Ascott doesn't really count!) and is hoping not to be discovered as a common flower girl (isn't the prince yummy :). Thank you so much for visiting!! Laura and Kazan will have a new sketch on Monday - so don't forget to check them out! 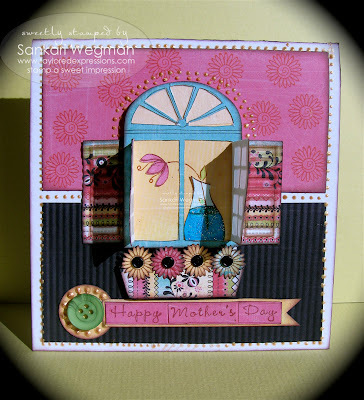 You can check out more details here to the Cinema Saturday Challenge of My Fair Lady! YAYAY! Its time for a new release at Taylored Expressions!!! Welcome to the first day of sneak peeks for the April release of two new stamp sets plus a whole lot of amazing new products over at Taylored Expressions!! I am soooo excited to be able to show you some samples from Taylor's newest release called Fresh Flowers from her Whimsical Wishes line. This set is really an incredible assortment of flowers and containers that are just amazing to color and put together in different ways. 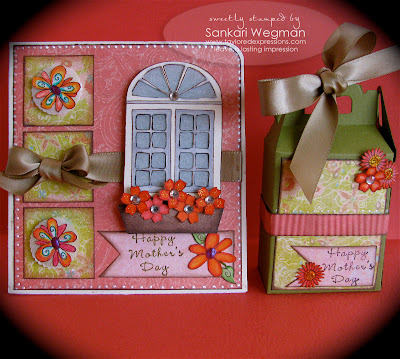 I love the versatility of the sentiments in this stamp set and for today's sneak peek I decided to create my Mother's Day Cards for my wonderful mother and mother-in-law (and if either one of you are reading this - you can pretend to be surprised :) love you both!!) . 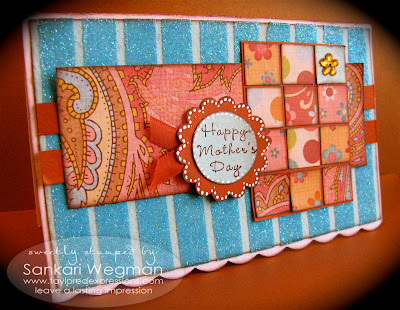 For both cards, I used the Mother's Day Key Ingredient's kit - this kit is absolutely wonderful and has beautiful heavy cardstock with coordinating Designer paper (double sided) with coordinating ribbon and rhinestones and flowers - it makes making a card so much easier because everything is right there. My mother adores flowers - she just loves loves loves anything that is bright and that is blooming. And she is an amazing gardner - I am always amazed by how she can create a mini greenhouse in our patio at home - and no matter how many plants she gives me for our home here... they invariable succumb to my lack of green thumb-ness :). So for this little card and gift set is for my wonderful mother! 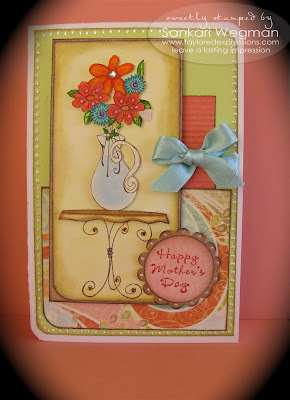 I used Julee's beautiful sketch from Mojo Monday#80 for this card . 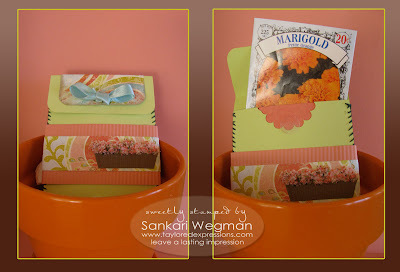 I also made a little packet of petite marigold seeds with a matching marigold-ish pot (marigolds are hugely popular in India - its such a happy bright and cheery flower isn't it?) 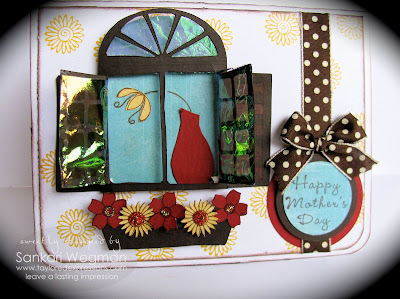 I used the same papers from the Mother's Day kit and also used some Flower Soft for the flowers in the planter... it gives such a wonderful feel and texture to the project. I used a little dot of velcro to close the packet. My second card is for my wonderful mother-in-law who I love to eat chocolates with! It is just so much fun to snack on a few pieces here and there as we chat and have some tea - its always funny to see how bar of chocolate suddenly disappears :) So for my gift set to my mother-in-law who also has a beautiful garden - I thought I could create a little card and coordinating gift set full of her favorite sweets: maple fudge! YUM! 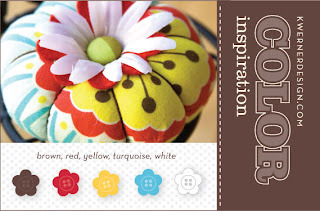 Stamps: Fresh Flower stamp set from Taylored Expressions! Woo-hoo!!! 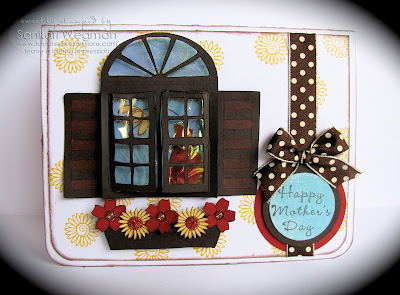 I cut out all the window frames in the window set and then put a piece of vellum behind it for the look of transparency. I cut out all the flowers and adhered them with dimensionals. 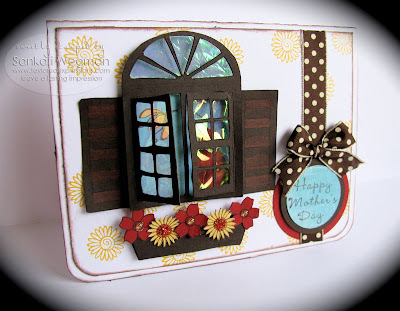 The window and the window box were also popped up on dimensionals. Well, I hope you had fun checking out these samples as much as I did putting it together !!!! sending you all LOTS of sunshine!!! PS - My fellow DT member Laurie Schimdlin is sick with the stomach flu and was unable to play along with us for the sneak peeks - but I know she would love it if you stopped by and wished her a speedy recovery! PPS - Head on back over here tomorrow morning for Day Two of sneak peeks! All I have to say... is this next set is just awesome! Labels: Favor Boxes, Flower Pot, Flowers, Fresh Flowers, Gift sets, Mother's Day, Mother's Day Key Ingredients kit, Pitcher of Water, SASI, Taylored Expressions.